Our Healthy Food and Drink WSLHD Ambassadors: WSLHD Clinical Governance Project officer Jessica Evans, Zouki manager Matthew Cahill and Westmead maternity ward nurse manager Vicki Wilde-Shooter. 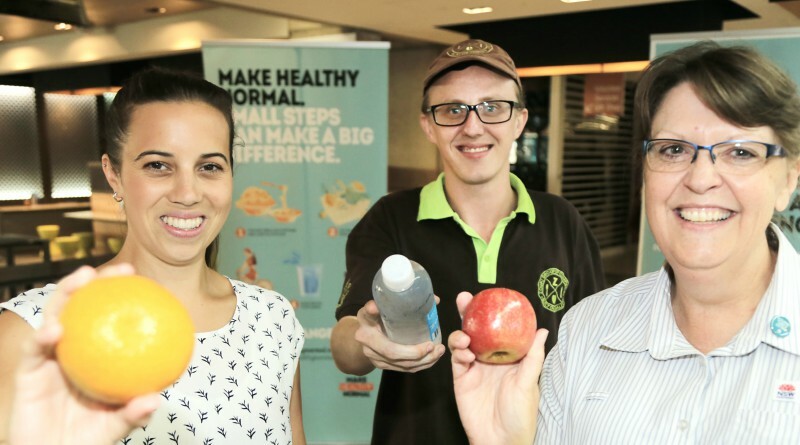 Over the coming months, Western Sydney Local Health District (WSLHD) will be working towards offering a broader range of healthier food in all retail and vending machine outlets at WSLHD hospitals. These changes are part of NSW Health’s Healthy Food and Drink Framework to move NSW Health facilities towards providing healthier food and drink options for staff and visitors. Removal of sugary drinks with no nutritional value was one of the first milestones achieved. WSLHD Population Health deputy director Christine Newman said we’ve had responses from more than 100 staff who want to actively promote the Framework to colleagues, patients, visitors and staff by talking about the changes on a regular basis. Westmead Hospital maternity ward nurse manager Vicki Wilde-Shooter welcomed the change to the supply of sugary drinks at the hospital. “Nurses and midwives work hard and depending on their shift they may not have time to bring their lunch,” said Ms Wilde-Shooter. Zouki stock manager Mathew Cahill agrees hospitals should set a higher standard and have a role to play in making healthy options available for people. “Making healthy choices available in hospitals is a step in the right direction,” Mr Cahill said. WSLHD Clinical Governance project officer Jessica Evans supports the move stating obesity and other health matters are on the rise in western Sydney. “As a health institution we have an obligation to lead the way in making a change,” Ms Evans said. The NSW Health Healthy Food and Drink Framework does not apply to food and drinks brought into our facilities by patients, staff and visitors.